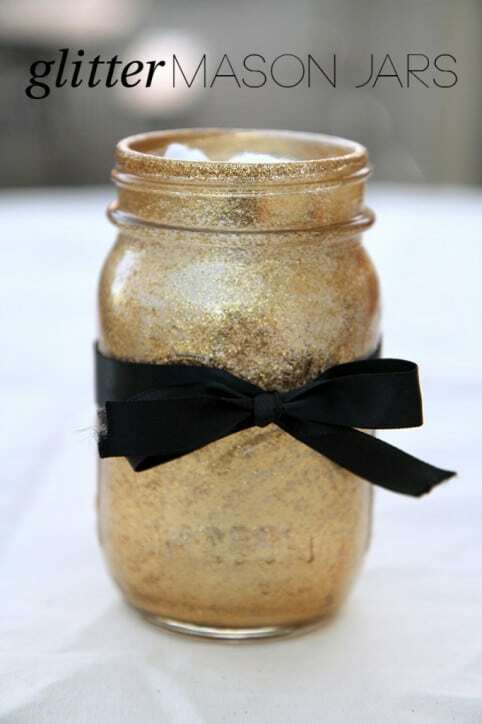 Sparkly mason jars are a wonderful way to add a bit of glamour to your party! You could make these in any color scheme to match your party. Start with a plain mason jar (check your local craft store, Wal-Mart, or order from Amazon). Add a little Mod-Podge and glitter, and let the jars for a couple of days. Tie a ribbon (a personalized﻿﻿ ribbon would be a nice touch) around each one, and you've created a lovely table decoration or party favor that is sure to impress. If you’re using these as table decorations, you could add ﻿flameless tealights for shimmery glow, or make each one into a flower arrangement. If you’re using the mason jars as party favors, you could add candies, coffee packs, savory snacks, or any little treat you want to include. Read the full directions here.